Our all-purpose cooking ovens My-Chef are perfect for your everyday cooking. 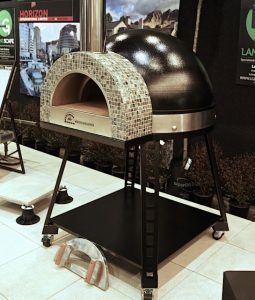 Many people still relate wood fired ovens to only pizza cooking, but really in this wood fired gourmet oven you can cook anything, from your everyday family meal to your 3 course dinner and of course the best wood fired pizza and any kind of bread. My-Chef with its higher dome and refractory brick internal dome make it ideal for cooking amazing slow cooked curry, fish in many ways, gratins, roast like roast should be, slow cooked soups and slow cooked meats, vegetables and potatoe dishes, grilled sausages and steaks, and of course fantastic home made breads and the best pizzas! 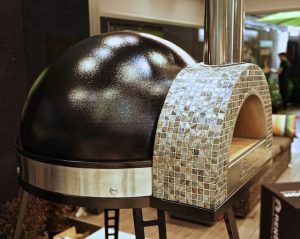 Experimenting with your recipes in your wood fired gourmet oven is a great way to enjoy your oven and become a wood fired oven Chef for your family and friends. My-Chef will stand out in your backyard as a stand alone or as part of your outdoor kitchen. Or have it in the patio, on the deck or even in a closed verandah or such adding an extension flue to go through the roof. You will see, your Chef will be the centre part of your home and of many enjoyable events. 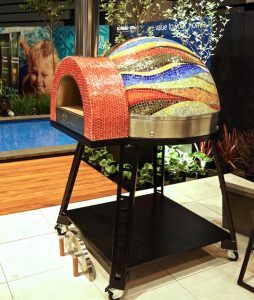 This wood fired oven with its charming looks it is a true jewel in any outdoor area. And with its ease of use, My-Chef turns any cook into a Master Chef. And once you are the happy owner of My-Chef we are always happy to advise you about any cooking, recipe, or wood fire questions. Basically, for all you need to become a great wood fired oven chef, we are here to advise you.